October 30 is National Candy Corn Day, which makes it the perfect day to make these Rice Krispie Candy corn Turkey Balls. They are sweet as can be and the kids will just love to help make them. Many national days are associated with food. What more perfect way to celebrate than with a favorite sweet treat? Find out all about these special days in my National Days Guide. 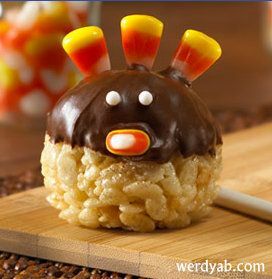 These adorable Rice Krispie Thanksgiving Turkey balls are so sweet. Let the kids help you make them, but they may not make it to the table!